As a JFCS Tauber Holocaust Educator Fellow with the Holocaust Center, I spent the summer immersed in Holocaust Studies at Yad Vashem, Israel’s official memorial to the victims of the Holocaust. We traced the conditions that magnified antisemitism throughout Europe and learned the dangers of Nazi Germany’s overzealous vision of “nationhood” that first ostracized and then attempted to annihilate the European Jewish population and other “undesirables.” Among fellow teachers, I recognized the ethical implications of our study: to expose patterns of exclusion that permit exclusionary national sentiment and to examine and attend to our “communities of accountability.” And it was in Jerusalem that I found myself returning “home”—to my classroom back in San Francisco and the layered history of the building that houses it. Stepping through the green gates of Stuart Hall, a K-12 all boys Catholic school in San Francisco, one is struck by the juxtaposition of a sleek, glass-clad, building with the subtle clapboard sidings of an old Victorian peeking over the courtyard. But it is the jade-green tiles adorning the soaring Japanese roof lines of our Morning Star building that truly standout. Located ten blocks from our main campus on Pacific Heights, Morning Star stands at the edge of Japantown. There is something about “space” that evokes the subtle ways we consolidate belonging. Morning Star Institute began as an elementary school, founded in 1929 by Albert Breton, the school served as the community’s response to the exclusionary laws that prevented Japanese, Chinese, and other “Asiatic” children from being integrated in local schools. 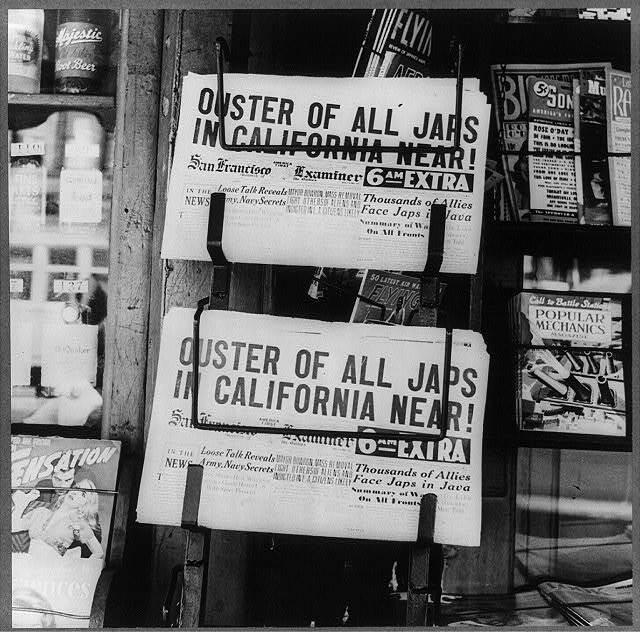 The arrival of the Second World War and the implementation of Executive Order 9066 by President Franklin D. Roosevelt in 1942 reduced the population of Morning Star as Japanese-American families were forcibly relocated to internment camps. After the War, the school’s population reflected the demographic shifts of Japantown and the Fillmore districts. Filipino, African-American, and Mexican schoolchildren studied alongside Japanese-Americans. By the time the Society of the Sacred Heart purchased the property in 2000, Morning Star Institute had long since closed. Dorothea Lange. San Francisco, California. 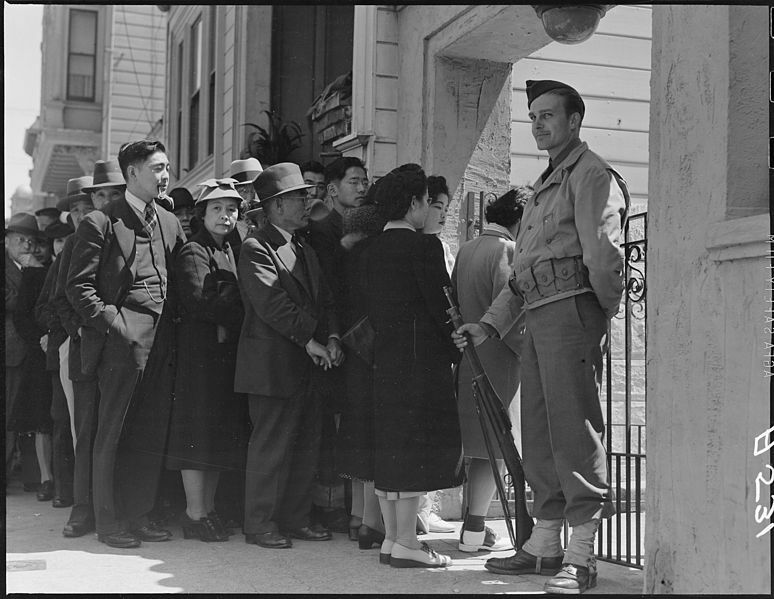 Japanese families lineup outside Civil Control station located in the Japanese American Citizens League Auditorium at 2031 Bush Street, to appear for “processing” in response to Civilian Exclusion Order Number 20. April 25, 1942. Stuart Hall students stand in a line to re-enact the 1942 evacuation process to which residents of Japantown were subjected. Among the young men I teach each day, there is scant attention given to the “Asian” building bordering our courtyard. It is home: ordinary and forgotten. And yet, it is perhaps because of its ubiquity that it came to my mind while I was studying the Holocaust in Jerusalem, thousands of miles away from San Francisco. In a recent assignment, Stuart Hall senior Leet Miller observed how “…we often overlook Morning Star’s architectural significance and historical gravity.”[i] Miller’s abiding interest in architecture led him to illuminate the stories behind its facade. 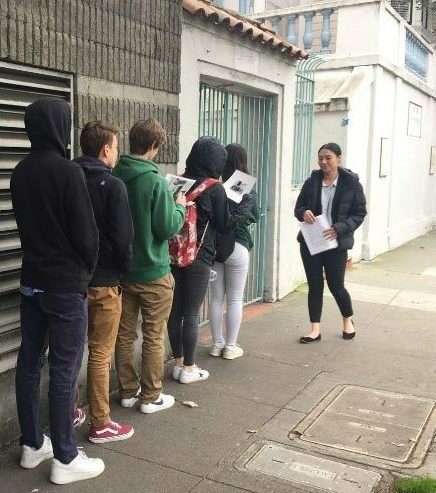 Through interviews with alumnae/i and former faculty, he retraced our inquiry beyond the green gates, into Japantown, and to the so-called Yellow Peril that forced Chinese and Japanese immigrants into enclaves throughout San Francisco. Leet encountered the spirit of gaman—a Japanese term meaning “enduring perseverance”—that defined the daily existence of first generation immigrants. By reflecting on these stories, Leet rehabilitated Morning Star beyond its facade, illuminating a building that “enfleshes” the complex history of a people, a city, and a nation. Oakland, Calif., Feb. 1942. Photo attributed to Dorothea Lange. Photograph from U.S. War Relocation Authority. No. A-36. Farm Security Administration and Office of War Information Collection (Library of Congress). 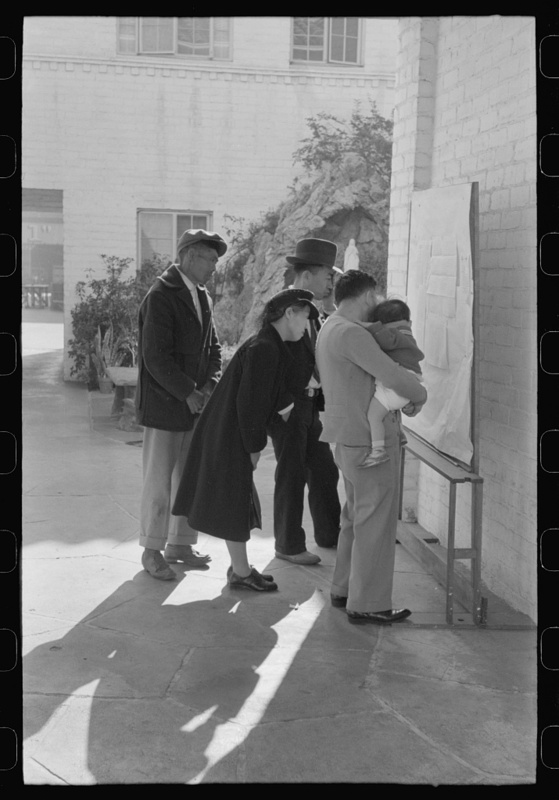 Japanese-Americans reading evacuation orders on bulletin board at Mary Knoll mission in Los Angeles. Photo by Russell Lee, 1942 April. Stories of migration ground the American imaginary. The experience of Japanese Americans exposes the insidious turns that come with cultivating citizenship based on fear. For most of us, exploring the horrors of the Shoah exposes the guilt that comes with forgetting and ignoring blatant acts of dehumanization. By turning our gaze to what is around us, to the spaces we occupy each day, perhaps we can more humbly discern the potent threat of history repeating itself. Morning Star is more than an architectural oddity among the elegant edifices of the Schools of the Sacred Heart. It stands as a quiet reminder: stories embedded in mortar, of enduring voices that speak across the silence of our forgetting.